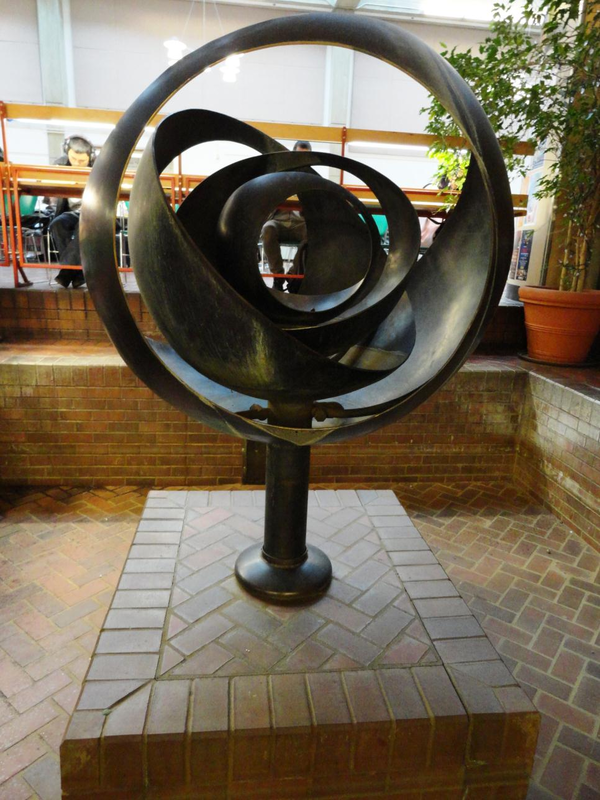 The New City Collegian » Editorials and Op-Eds • The Latest » What is actually broken with the Tsutakawa Fountain? Not much, it turns out. You might have seen the posters urging you to join the Tsutakawa Fountain committee. You might have attended the fundraising gala with taiko drums and dignitaries. You might have been one of 700 people to sign the petition. Driving all tha effort was a number: $99,540. That’s what a consultant’s report suggested it would cost before the fountain could flow again.Turns out Fountain by George Tsutakawa just isn’t that broken. That’s right. In a couple of minutes, the fountain could be flowing like it did for over 40 years. So why won’t the administration just turn it back on? Phase 1 is brick repair, brick cleaning, brick sealing and scrubbing down the fountain itself—and that doesn’t include buffing up the bronze patina. Cost: $13,140. Phase 2a is a sanitation system, new pump, and a little plumbing. Cost: $68,540.Phase 2b is putting a railing around the fountain. Estimated cost: $18,000. That’s about a thousand bucks a foot. Why a railing? The administration reportedly was concerned about safety after a student fell into the now-dry pit of the fountain. The Fountain Committee pointed out that the symbolism of placing a fence around Tsutakawa’s fountain is insulting in light of the history of Japanese internment. During spring quarter of 2013, the administration conceded the fountain didn’t really need a railing after all.That still leaves over $80,000 in possible costs to renovate the fountain, according to the consultants. That’s big bucks, and a lot of it supposedly for sterilizing the water. But NCC has found that the push to sanitize makes no sense. Fountains in casinos, malls, and hundreds of other Seattle public places operate safely with un-sanitized water running in them. Perry says he is “not familiar with any regulations that require sterilization” of fountains.Moreover, he claims sterilizing water doesn’t need to break the bank. “A simple sterilization unit could go for $120. This type is used for swimming pools and uses chlorination tablets, but I don’t think you even need that,” he said. “Guidelines for Control of Legionella in Ornamental Water Features,” published by Legionella Risk Management Inc., points out that every disease outbreak from Legionella was associated with submerged lighting, which heats the water. Only water heated above 68 degrees can be hazardous. Moreover, bacteria mostly form in environments with biofilm, cloudy or dirty water, and where there are sources of nutrients such as amoebae, protozoa and algae are present. Finally, Legionnaire’s is caused by inhaling contaminated water.That only happens with water features that create mist. The Tsutakawa fountain doesn’t have any of these risk factors. With no submerged light fixtures, the water is cool. It’s continually cleansed by the existing filtration system. And it’s also of the non-aerosol variety, meaning that it emits very minimal droplets. Not to mention that hundreds of fountains in Seattle do just fine without zapping the water. Even if you wanted UV sterilization Perry says a 40 watt UV system that sterilizes 2,000 gallons water would cost $400 to $500. How much would a new pump cost, if the Tsutakawa fountain actually needs one? “A high quality in-line pump would range from $900-$1,100, which would last a long time,” says Perry. So why are the report’s numbers so high? In an interview with NCC, Sally Roth of Johnston Architects explained that her report is “conceptual” and that a contractor provided her the numbers. Roth says she helped organize the numbers and break the project into phases. “Not until this gets turned into a real project will it be more detailed,” she says. The contractor that provided the numbers for Roth’s report is a company called Turnstone Construction, which specializes in, according to their website, “designing and building naturalistic habitats and water features for public, commercial, and residential clients.” NCC attempted to contact Turnstone multiple times to understand how many hours of labor a project like this would entail, what models of sanitation systems and pumps would be used, and their specific costs. Turnstone has not replied. Looking for answers, NCC contacted Chuck Davis, Director of Facilities, to ask what specifically was malfunctioning or in need of upgrades regarding the Tsutakawa Fountain or its electrical or plumbing system. What plumbing issues affect the fountain renovation? Are there legal requirements for sterilizing the water or installing a railing? How much did the school pay to Sally Roth or her employer, Johnston Architects, for the $99,540 “conceptual” report? Davis declined to talk with NCC reporters, and forwarded questions to Janet Grimley, Interim Director of Communications. Grimley has not replied to those questions forwarded from Davis, nor responded to multiple e-mails queries. NCC was informed by district staff that it would have to wait three months before the college would fulfill a public records request for documents relating to the Tsutakawa Fountain project, including a request for the cost of the Roth report. NCC invited President Killpatrick to make a statement concerning his position on the fountain’s reconstruction and recent fundraising efforts, but he has not replied. State law requires three bids on projects over $5,000 funded by public dollars. Given that Fountain committee has raised over $20,000, that should mean the fountain restoration could start immediately. Amount over which state law requires three bids for construction projects funded by public dollars: $5,000.